Almost losing my files on my USB external HD last week, thankfully it worked after long time looking for a solution on Google. Here is my situation. I had my external hard drive disconnected from my Mac many times (with Mavericks OS), and finally my external hard drive was not showing on finder, including the partitions (I have two of them). So I tried to disconnect the HDD and reconnected it again, also waited for a period of time, and still could not see them. However, I could see it on Disk Utility. You can hit “CMD + Space” keys, and will display spotlight, type, “Disk Utility” to open it. In case you need a new external HDD check out Amazon for the affordable best seller. So in my case, it was a 2 TB Seagate USB drive, and I had 2 partitions on it, I called, “Expension Drive” that I use for Time Machine, and the other one, called, “PC Drive” that has NTFS partition (for my Windows OS computer), and these 2 partitions of external hard drive not showing on finder of my Mac. 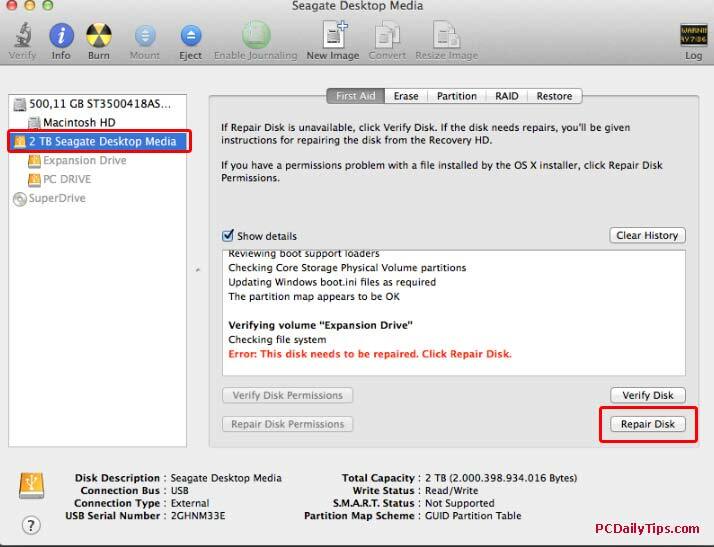 In the below screenshot, my 2 TB Seagate is shown in Disk Utility, however, the 2 partitions are greyed out. If I mount of the partitions, it will show me the “The “Expansion Drive” disk could not be mounted”. Because I never had this problem before I looked for hours until I got the solution in the internet, finally I found my own solution for this specific problem. Reconnect, and disconnect the disk. But eject them properly from finder.
. Check on “Finder Preferences” (you can open your Finder and open “Preferences”) if under “DEVICES” the “External disks” is checked. 3. Switch off my hard drive, restart my Mac, and turn my HD on, connected it again to my Mac, and still didn’t work. 4. Quitting “‘fsck_hfs” from Activity Monitor (discussed in this forum). So here is my solution. Note, that, in this situation, my Hard Drive is shown in “Disk Utility” but not in Finder. 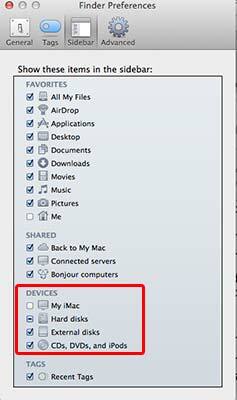 So, if yours are not shown in Finder and Disk Utility, then this might not for you. Please consider your own risk. 1. So if you don’t see your external hard drive on Finder, check them in your Disk Utility. There are many ways to open it, easiest, look for it on your spotlight. 2. Then see if your hard drive (or partition) is listed. Even if they are greyed out, it doesn’t matter, as long as you still see they are listed. 3. 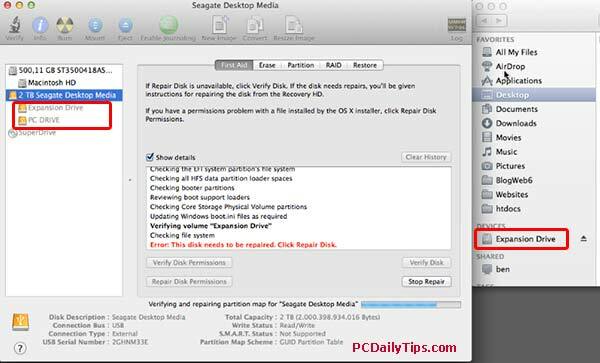 Now, select you “hard drive” mine, I selected, “2 TB Seagate Desktop Media” name, see screenshot below, and on the right area, click “Repair Disk”. This is what happened after I clicked “Repair Disk”. The “Expansion Drive” is shown, but the other didn’t. Then I did it again, it shows all OK, but still didn’t show in Finder. So, you will need to click “Repair Disk” button again, until both of them shown in Finder. Today, my old external HDD, acting up, I could not verify and repair disk, with red name, and even the name was changed, thankfully, it was still recovered. (as long as it is shown in Disk Utility). What I did after repairing disk did not bring any result, I did, “eject disk” after right clicking the HDD’s name, then disconnect it from my Mac, and connected again, and surprisingly, it shown immediately on Finder. Thanks, Kimi. I had the same problem. OS X no longer “just works.” Not only is Apple getting more and more fashion-oriented and superficial, it’s obvious that they are not paying much attention to the serious side of OS X, only adding stuff (and not always well) that supports their mobile side and their various service lock-ins. Combine this with their “throw-away” hardware and I think that the best days of really solid Apple computers are behind us.